On June 10, 2016 the CBI team was repairing current profilers and wave sensors at Bob Hall Pier. 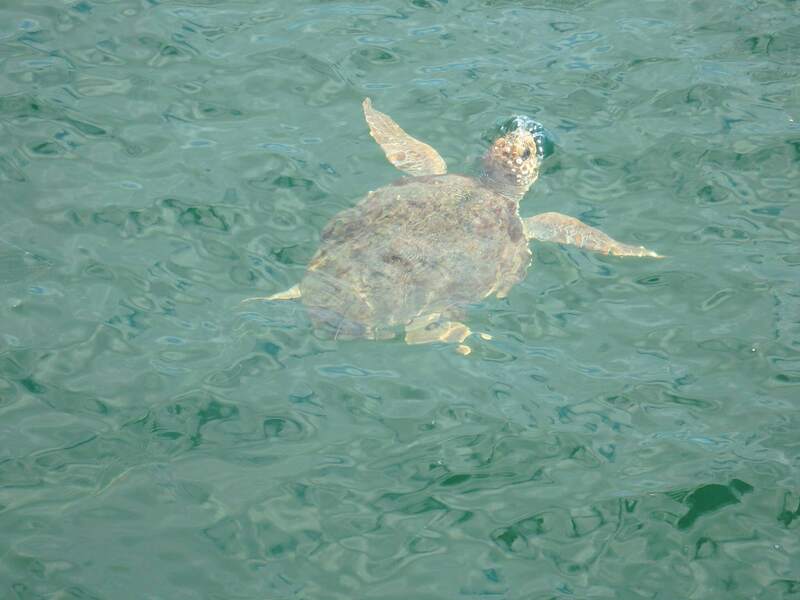 Fishermen alerted us that a turtle was in trouble; one of its flippers was entangled in fishing gear. 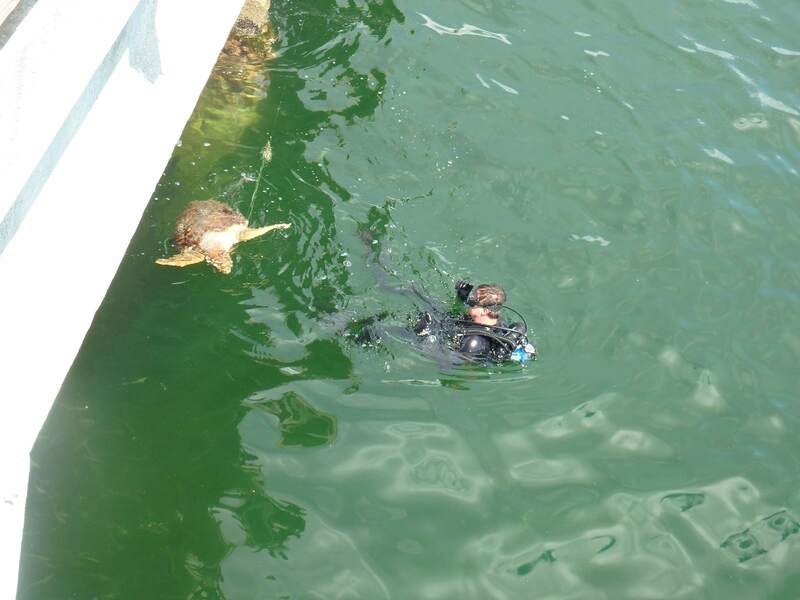 Our diver, Dominic Burch, was relatively close to the scene and came to the rescue. The turtle, a loggerhead, became quiet shortly after Dominic started working to disentangle the flipper and cut the line. 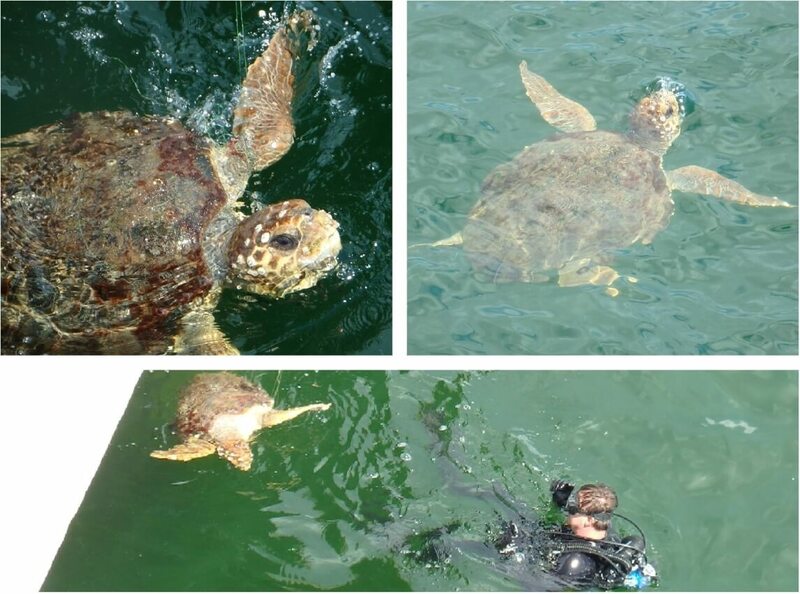 It was freed and swam away, hopefully recovering smoothly (‪#‎BobHallPier ‪#‎SavedTurtle #ConradBlucherInstitute #CBI #TAMUCC). Many liked the pictures and the story of our loggerhead rescue. We managed to capture the rescue on video and asked one of our undergraduate research assistants, Esteban Hiracheta, to put together a short movie of the rescue (below). We also added some information regarding another CBI contribution to turtle conservation and recommend that readers visit the sites of the major contributors to sea turtle conservation and research in the Coastal Bend, the Padre Island National Seashore and the Animal Rehabilitation Keep (ARK) at UTMSI. Enjoy! The Coastal Bend is home to many sea turtles including endangered species. Learn more about the “Sea Turtles of Padre Island” through the Padre Island National Seashore. CBI also contributes to saving turtles through its research and operational models. The Laguna Madre is a shallow water body which temperature can drop precipitously during cold fronts. During recent events as many as 1,500 turtles (February 2011) were cold stunned and rescued by volunteers, local, state and federal agency personnel. Turtles were then rehabilitated at local facilities such as the ARK. Thanks to a collaboration between the Conrad Blucher Institute, the Gulf Intracoastal Canal Association (GICA), Texas Parks and Wildlife and the Coastal Conservation Association Texas (CCA Texas), barges and other work had stopped in the Laguna during this cold water event (see Figure below). A key element in this collaboration was a model, which predicted when to stop traffic/work in the Laguna Madre 24-36 hours prior to the event. This allowed planning around the interruption. In 2008, the Conrad Blucher Institute designed and implemented an artificial neural network to do just that. The model was operational until 2014. Funding is sought to update and restore the information technology systems that make running this model possible. (Figure A) Water temperature and number of cold stunned turtles rescued during a February 2011 cold water event. 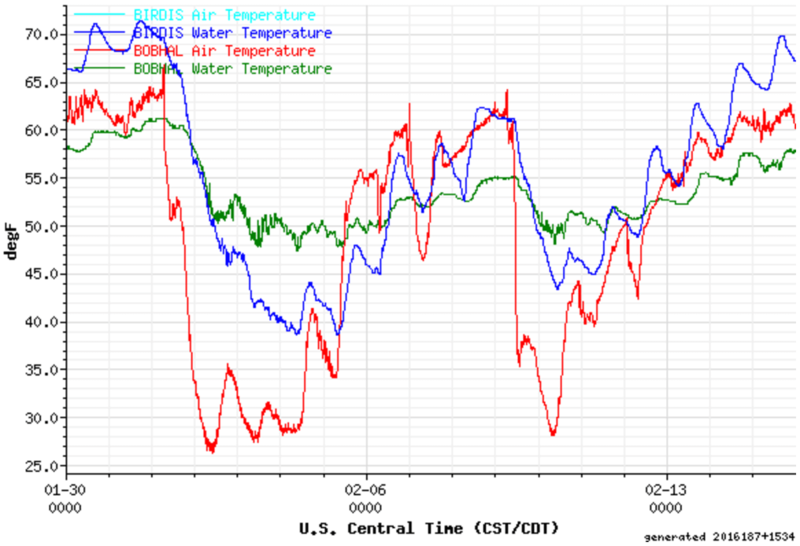 Note that during the first cold front, water temperatures stayed below the threshold of 7°C for about 2.5 days while during the second cold front the temperatures stayed only for about 3 hours below 7°C. A navigation and activity interruption was advised for the first event but not the second one. (Figure B) Illustration of the dynamic of water and air temperatures in the Laguna and the Gulf of Mexico during the same period.